Why would you buy an indoor golf simulator? 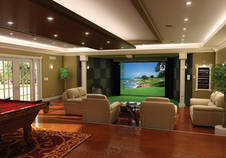 Designing your own golf courses Why would you buy an indoor golf simulator? The components of a golf simulator How does a golf simulator work? To conclude all the ideas that you will find in the following lines, we tell you the answer from the start: because it is pure fun. Bringing a sport that needs a great surface inside a house and keeping it close to reality in the same time definitely is a great achievement of modern technology. In case you may wonder about the usefulness of an indoor golf simulator, think of the ones that live in an area with a climate that does not allow maintaining a golf course in the best conditions all year long. The ones that are passionate with golf would have to travel hundreds of miles not only for matches but also for training. This leads us to the biggest advantage of a golf simulator: the opportunity to practice whenever you want without going outside your house, without pressure and with the possibility of simulating various courses and conditions. Advance golf simulators offer an extremely high degree of realism so they can be successfully used for improving your game. Studying different shots, different club heads and different strokes and making a comparison is now extremely easy. Most golf simulators come with dedicated software that are going to display all the parameters of the shot, making it easy to see where you have gone wrong and where you can improve. Copyright © 2008 golfsimulators.org . All Rights Reserved.